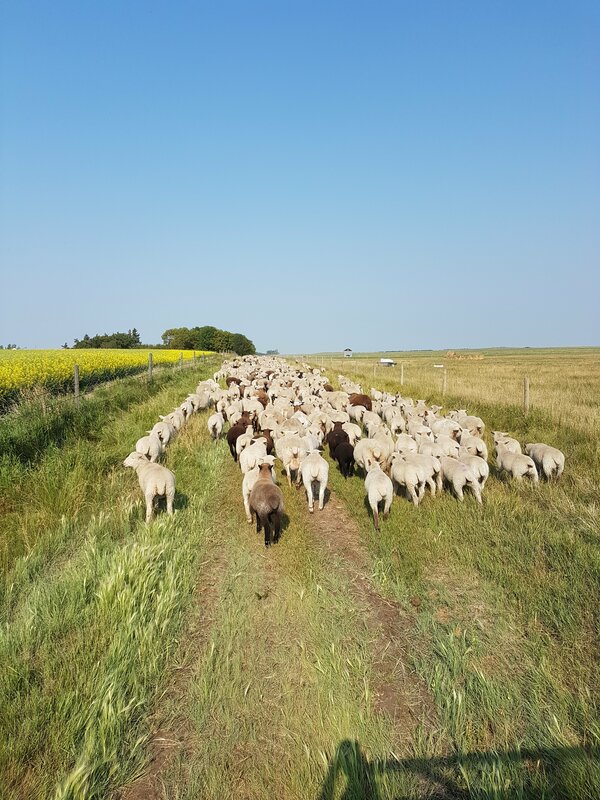 July | 2017 | Loch Lomond Livestock Ltd.
Strung out, looks like a lot of sheep! Thor, running alongside the side x side, afraid of thunder. Should’ve paid attention to Thor, got hit a few times with these guys! Made it. Lots to eat here for a couple weeks. We continue to be dealing with hot and dry weather. We have had very little precipitation since last fall, meaning that many of the watering areas are drying up. 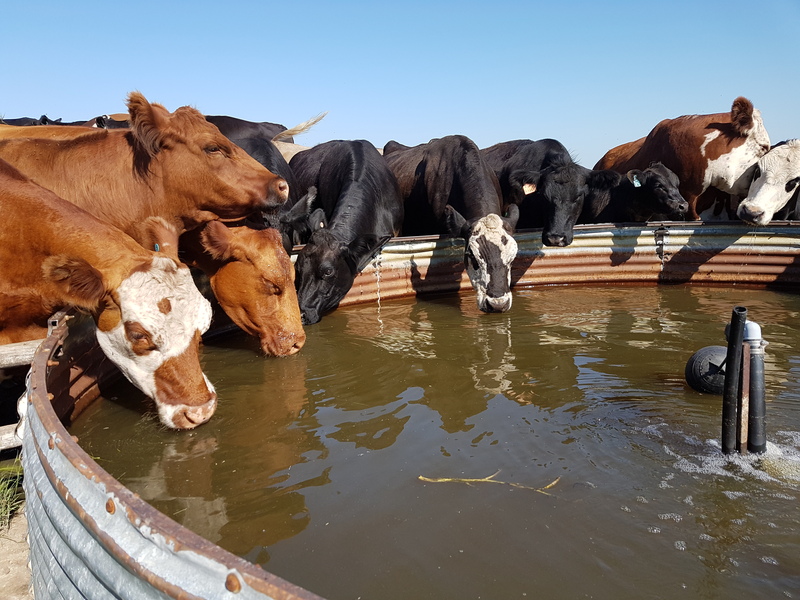 Recently, there was a case in the province of roughly 200 head of cattle dying from poor water quality leading to dehydration and salt toxicity. After years of water lying everywhere, it’s a harsh reminder of how quickly things can change, and how important water is to all living things. Where our cows currently are, we are pumping water out of dugouts (ponds) into troughs, which helps keep the water cleaner. In hot weather, it means pumping water at two places each day to ensure water is always available. One group of cows does have other sources of water, but generally prefer the water out of the trough. 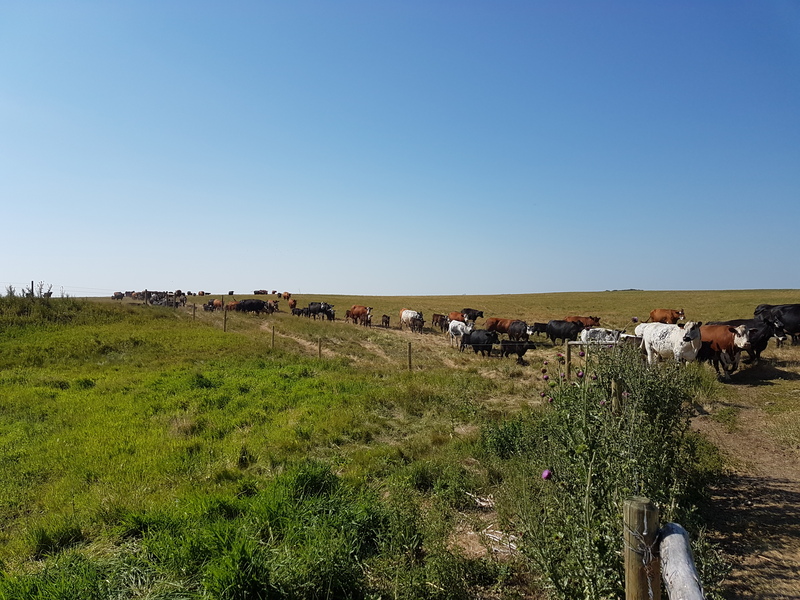 In spite of the hot weather and pastures getting dry, the cows are in excellent shape and the calves are doing well. 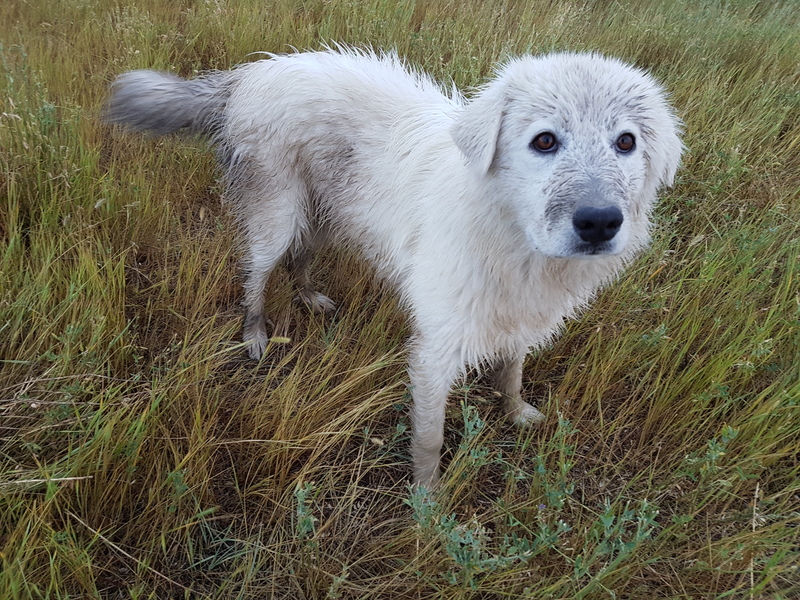 Livestock guardian dogs continue to impress me. Their instinct to protect is strong, and watching their behaviour is always interesting to me. 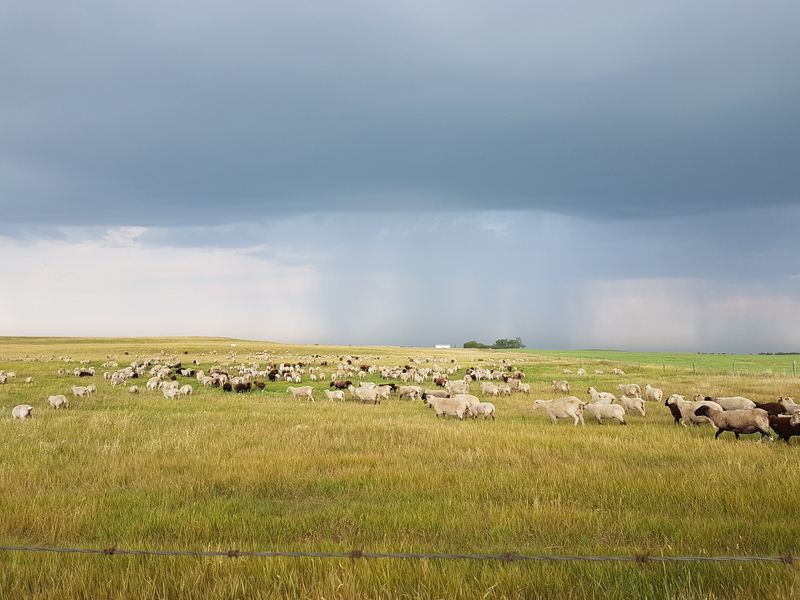 This particular day, we had some rain, which was a very welcome reprieve from the very hot and dry summer we have been having. 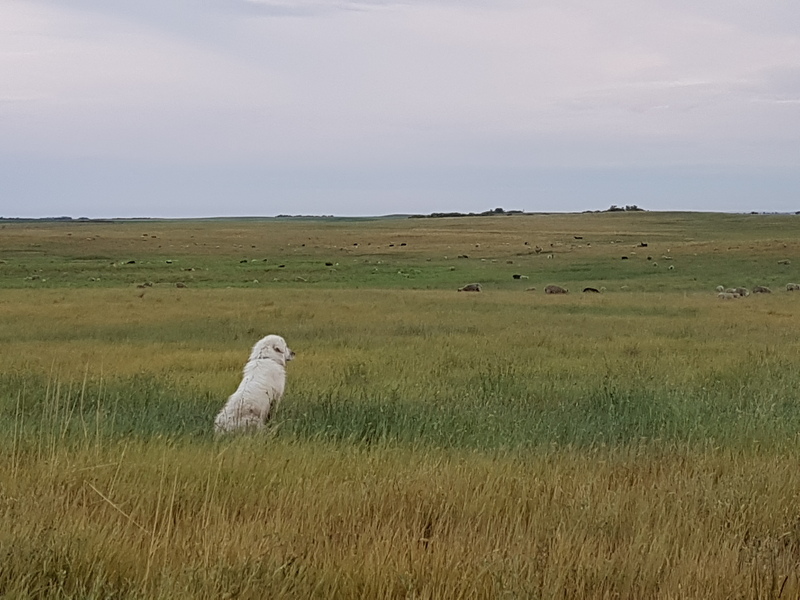 As I approached the sheep pasture, Sam appeared, then slowly as I drove across the field, the other dogs appeared, save for Fern. Often the pups, being curious, show up as soon as they hear the side x side, but even as I continued through the flock, she did not appear. I carried on, wondering where she may be, until I reached the far side of the field. There she sat, facing the flock, back to the fenceline, on top of a hill where she could see a long way in every direction. It was the perfect spot to watch her flock. She happily came over to say hello, pose for a few pictures, and then resumed her watchful position. Fern, showing the effects of the day’s rain. Raising a vulnerable prey species can be challenging. The most obvious of these reasons is predators. For the past several years, we have had very few problems with predators. This year has been a different story. Coyotes have been predating the sheep this year, mainly taking lambs but occasionally a ewe. It appears that this year, we seem to be situated in the middle of 2 or 3 families, one of which I suspect has decided lamb ranks high on its preferred menu choice. 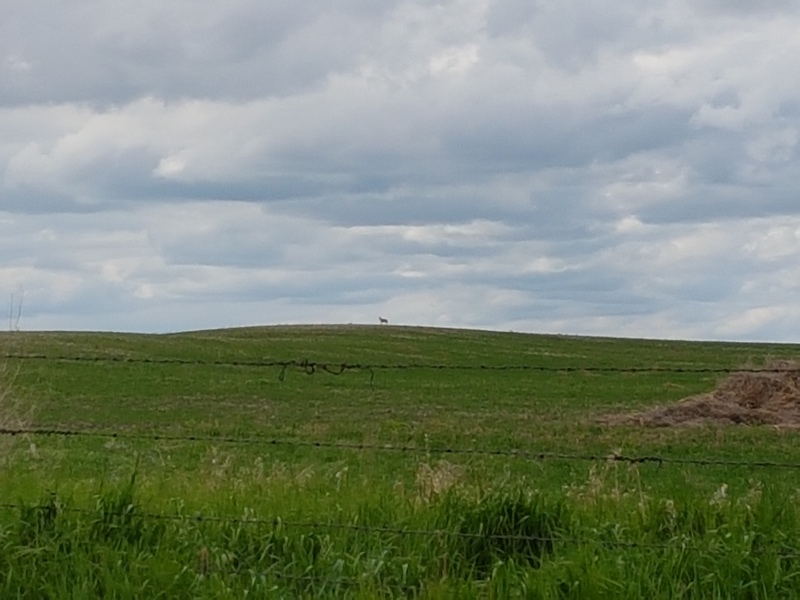 We have also seen a lot of coyotes around this spring, so likely the increased numbers mean food competition is high, and lambs are relatively easy meals. This seems to be coinciding with a change in flocking behaviour of the sheep. In previous years, I often notice how tight the group is flocked, rarely being spread out, even in small pastures. 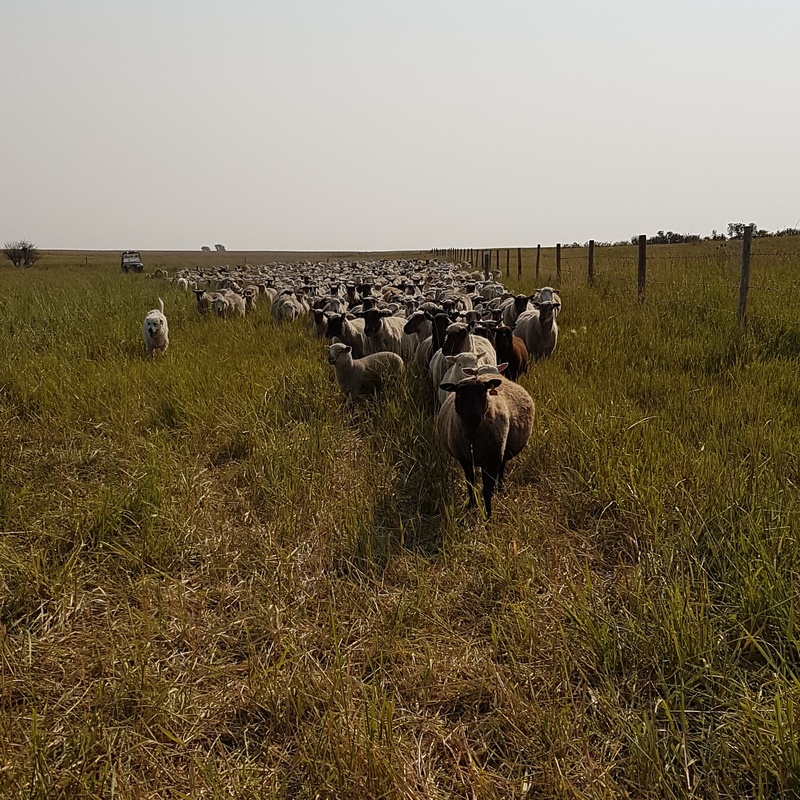 This year, for some reason unbeknownst to me, the flock will be spread over nearly the entire pasture, seemingly oblivious to the increased predator pressure. 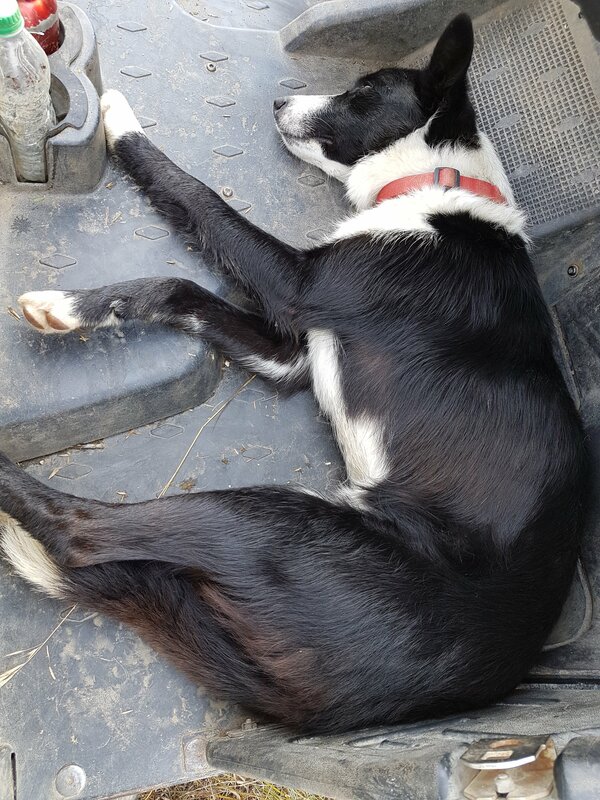 This also makes it difficult for the dogs to effectively protect the whole flock. 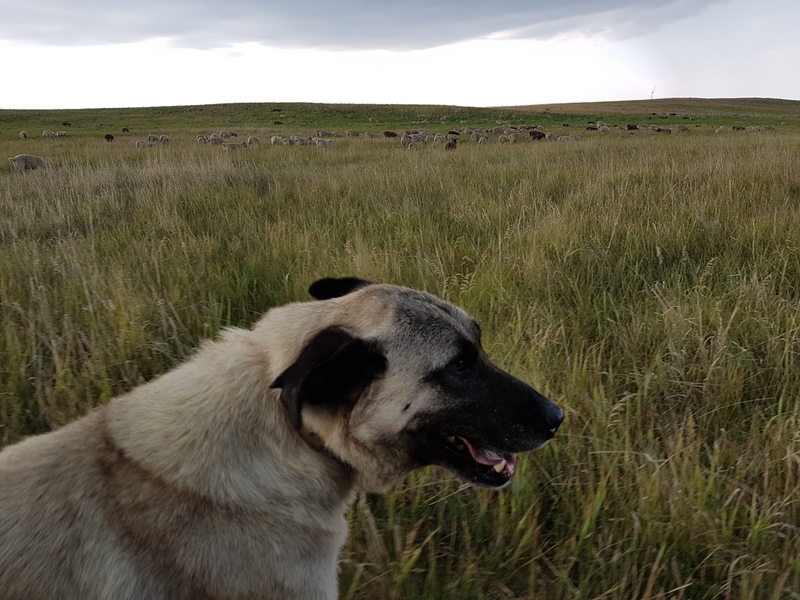 In an effort to help the dogs and reduce the kills, I have been gathering the sheep together each night, and also borrowed a dog from neighbours who have more dog power than they need. While I these efforts may be helping, they have not stopped the kills. 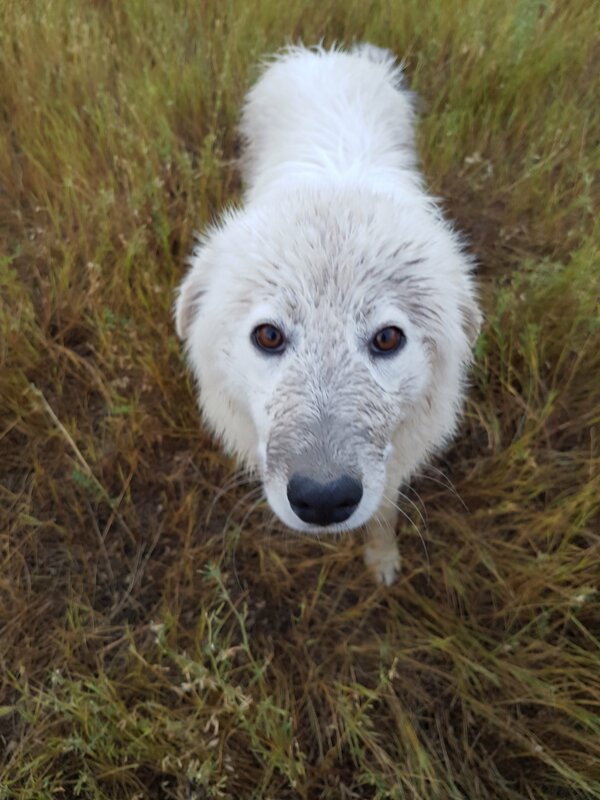 Once coyotes learn to hunt sheep, they are hard to deter. Luckily, we have a provincial program where a predation specialist can come and attempt to remove the problem coyotes. He will be coming back this week, and with some luck, he might be able to remove the guilty parties. Classic coyote kill- they grab them by the neck and collapse it. The dogs showed up just a few minutes late for this guy, as the coyote had just begun to open him up. Predation is one reason why many people choose not to raise sheep, and while I have no plans to stop, I can certainly empathise with them. 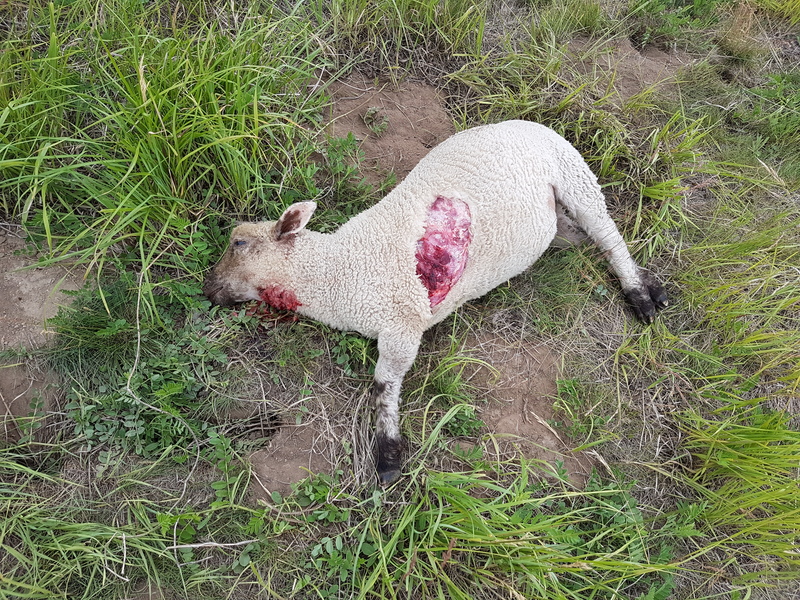 Aside from the obvious economic loss of dead or missing animals (although we do have a provincial wildlife loss compensation program which provides some reprieve), it is terribly demoralizing to continually find lambs predated. 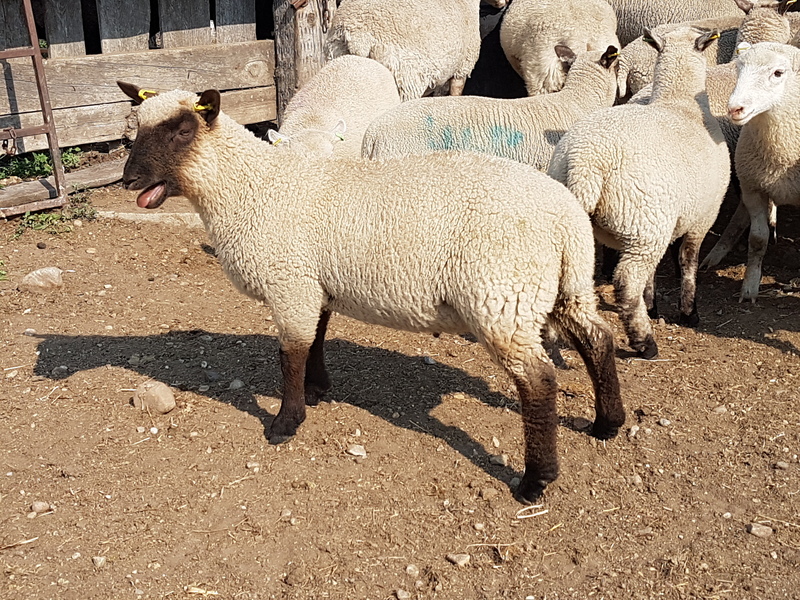 Often they are nice, big, healthy lambs that are found, which would have been excellent market lambs in the fall, or replacement ewe lambs. 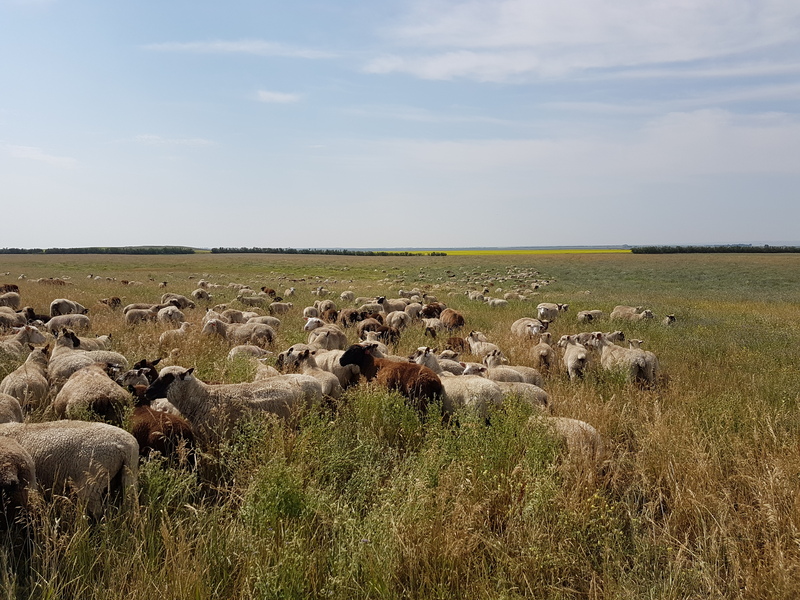 It is also difficult knowing that there is this continual pressure on the sheep, and aside from either corraling and feeding, or spending every minute out with the flock (neither of which are practical) there is little I can do to prevent these losses until those problem coyotes are removed. 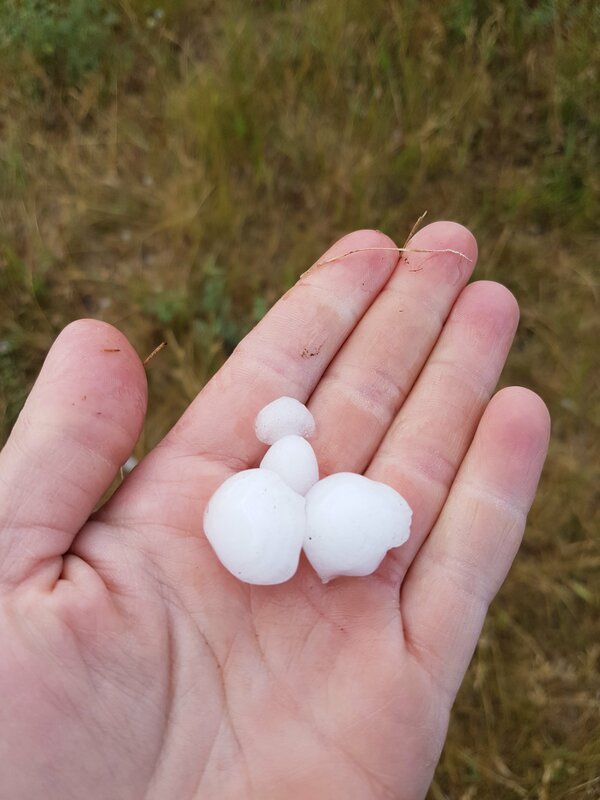 Part of our farming philosophy is to coincide with nature, and this is another reminder of how nature makes her own rules, despite our plans.